Officers Tased a man who used a broom and then a deadly shovel to assault a California Highway Patrol officer on Tuesday, according to the Grover Beach Police Department. Around 11 a.m., the CHP officer was working a traffic assignment on Highway 1 in front of the Grover Beach Train station. The CHP officer reported he was being confronted by an aggressive man and called for assistance, according to a police department news release. Grover Beach police and additional CHP officers responded to the scene. The suspect, 29-year-old Calvin James Rowan, had armed himself with a broom and later a shovel that was being used by work crews, Police Chief John Peters stated in the news release. 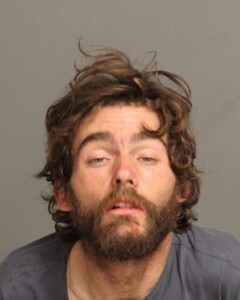 Rowan, a Grover Beach resident, was threatening to attack the CHP officer. When other officers arrived, Rowan refused all commands to drop his weapon and surrender. Rowan was then Tased and taken into custody without further incident. No officers suffered any injuries. Authorities took Rowan to a local hospital where he was medically cleared. Officers then booked him in San Luis Obispo County Jail on a charge of assault with a deadly weapon upon a peace officer. Rowan remains in the San Luis Obispo County Jail with his bail set at $2,000. What the hell happened to Kenny Loggins? OK, I chuckled at that one. Now what the heck is this? You attack a cop in California with a shovel, and get tazed, but on the otherside of the country you get shot when your hands are up. this world is weird! WEIRD! Ferguson, Mo? It never happened the way you framed it. Get real. Love the mug shot. Wonder if I would get in trouble if I used it as my Facebook photo? As long as you aren’t planning to apply for a job anytime soon (or date a woman). Boy these guys are really tired. THAT, is the single greatest mug shot ever! You don’t even need a story to go with it! Just look at the picture and yep, whatever they say he did, I believe it! Will the unidentified “work crew” be reprimanded for leaving the dangerous weapon unattended? This would never happen if the personal liberties whackos would allow us to enact sensible shovel legislation. You might be on to something there ! In World War I , the most valuable hand-to-hand weapon in the trenches was a shovel. With filing on the edges, one could decapitate an enemy with one quick thrust under the chin. Good as a slashing weapon, too.